Welcome to the 6th installment of our online holiday newsletter, to go with the creative photo cards that Carrie puts together every year. This year's card's theme is "Rockin' the Holidays " as we gather around a game we can play as a family. If you didn't find your way here because of the photo card, you can see a picture from it below in the family section of this newsletter. We hope this online newsletter finds each and every one of you, doing well. Don't let the economy affect your holiday spirit. May your holidays be a time of happiness spent with family and loved ones, creating new fun-filled memories. Ashley is our 20 year old University of Colorado junior. She chose a major in Economics at CU as she finishes up her final year and a half as an undergraduate. After many years as a summer life-guard, Ashley continued her during-the-school-year job as an assistant at an on-campus program at CU this past summer. Ashley can be seen in her photo in front of her current Boulder apartment with her boyfriend Britton on her right, and her brother Tobey on her left. Tobey is our five and a half year old Kindergartner. 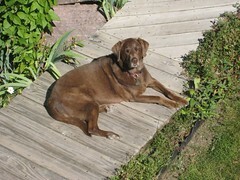 Twizzler is our 11 year old chocolate labrador retriever. She is gracefully heading into old age, and while she still expects her daily walk, she's moving a little slower around the house these days. Mention a peanut-butter sandwich to her though, and it instantly takes years off, at least until she devours it. 2008 was a busy year with several celebrations for Carrie and Alan. We celebrated 10 years of marriage in April. Tobey stayed with my Mom and Dad for a week in Boulder while we went to Grand Cayman. Our efforts to upgrade the house that we've lived in for 11 years, and probably at least another 10, continued with remodeling the master bathroom. Our software and internet development company - DecaTech Solutions, celebrated 10 years of existence.